Why Buy a Pool Heater? A pool heater can help keep your water temperature perfect any time of day or year, enabling you to enjoy your pool for longer. In any climate, pool temperatures can vary based on a variety of factors, including rainfall, pool size and the amount of sunlight a pool receives. If you live in a colder climate, such as Texas, certain heaters can extend your pool season despite how the outside air temperature feels. There are three main types of pool heaters: electric heat pumps, solar and gas/propane. Depending on the type of pool you have and the seasonal weather of where you live, one may be a better fit for you than the other. Below we explore the differences among each type as well as the pros and cons of each. 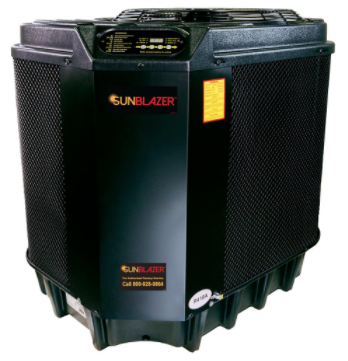 There are 3 main types of pool heaters available, electric heat pumps, solar and gas/propane heaters. A fourth type, electric resistance heaters, are primarily used for hot tubs and use a lot of electricity, so we focused on the 3 most popular. Depending on the factors above and the type of pool you have (above ground/inground), one may be a better fit for you than the other. For more information on how heating power is measured, check out this link. How do gas heaters work? Gas heaters use natural gas or propane that is ignited by a flame to heat water as it runs through the unit. The water passes through a series of tubes that go through a burner, and the water temperature is raised by coming into contact with the hot coils. A gas heater is perfect for cooler climates. They can run in any weather, even windy conditions, and they can run at any temperature. While a heat pump will extend your swimming season 2-3 months, depending on the location, a gas heater will enable you to swim year-round. Gas heaters also have an advantage because they can heat the pool faster than other types after being turned off. They are the best at raising the temperature quickly, making them ideal for weekend use, when guests arrive, or with second homes. Gas heaters can also heat a spa or hot tub. Many people use gas heaters to heat hot tubs because they work quickly. 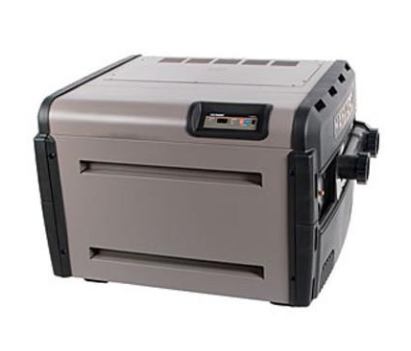 One other advantage that many people do not consider when purchasing equipment is that gas heaters tend to be compact, so they do not take up much space on your outside concrete pad. Gas heaters tend to cost more to run than other heater types. Although fast, heating a cold pool can require a lot of energy and therefore can be expensive. Heaters are most effective when used consistently. Most people use gas only to heat a spa on short notice. Propane and natural gas prices vary, but are generally more expensive than the electricity used to run heat pumps and solar heaters. You will also need a dedicated gas line or tank installed. Gas heaters are most effective when they run consistently, so keep that in mind. Heat pumps use the outside air to heat the water. Warm air is drawn over the evaporator coil by the fan. The water runs through the heat exchanger and comes back into your pool through your inlet. Because they use ambient air, these pumps will not function well at temperatures at or below 45 degrees Fahrenheit. They heat the water slowly and are not recommended for hot tubs or spas. Heat pumps are much more economical than gas heaters if they remain at a moderate temperature. They help to maintain a consistent temperature. As long as the temperature remains modest, a heat pump will be much cheaper to run. A heat pump is also compact and will take up a relatively small footprint on your swimming pool’s existing concrete pad. Heat pumps have a longer lifespan than gas heaters and require less maintenance. Heat pumps do not warm as quickly as gas heaters, but they are more efficient. If you use your pool every so often, then this type of heater is not ideal. It will take a long time to heat the water if it has been left to the elements for too long. Heat pumps will not work well in temperatures below 45 degrees. A heat pump requires a dedicated electrical circuit. How does a solar heater work? A solar heater is an array of panels, usually on the roof, that absorbs the sun’s energy to heat the pool. Water is pumped through these panels (or collectors) and is warmed by the heat of the sun. In hot environments, the system can also be used to cool water by running at night. The collector tubes may be glazed or coated, giving them a greater efficiency but costing more. The biggest advantage of a solar system is the heat from the sun is free. The electric costs of running a pump to push the water through the collectors are noticeably lower than the other heater options. They are also low maintenance and last a long time. Since a solar heater depends on sunlight, areas that are cloudy or shaded will not be best for performance. They do not heat at night. Pumps for solar heaters must run continuously to push the water through the panels. This is generally done by your existing pump, so it won't drive up the cost to run, but in some cases they may need an additional pool pump. This is because the water has to go a long way, often onto a roof, in order to travel through the solar panels. Many solar setups require 75-100% of your pool’s surface area in solar panels. The larger your swimming pool, the more space you will need for the collectors. Additionally, the initial solar system set-up is more expensive than the other types. A gas heater will cost you significantly less initially than either a heat pump or solar heating system. Most gas heaters will cost a few thousand dollars. Heat pumps and solar can cost more, and the cost may not include set-up and installation. Set-up costs can vary based on the size and location of the pool, and the amount of heating power (BTUs) that the unit provides. Any heater type can be used with inground or above ground pools. Regardless of which method you choose, solar blankets or covers will help you to keep maintenance costs down. Solar covers help to trap the heat in your pool, extending the usage time. Suncoast Solar Trap Liquid Solar Blanket is also a great method for trapping heat. Think of the blanket like a lid on a hot beverage, it keeps the heat in! If you have any questions about the best heating solution for you, don’t hesitate to call the experts at your local Pinch A Penny.